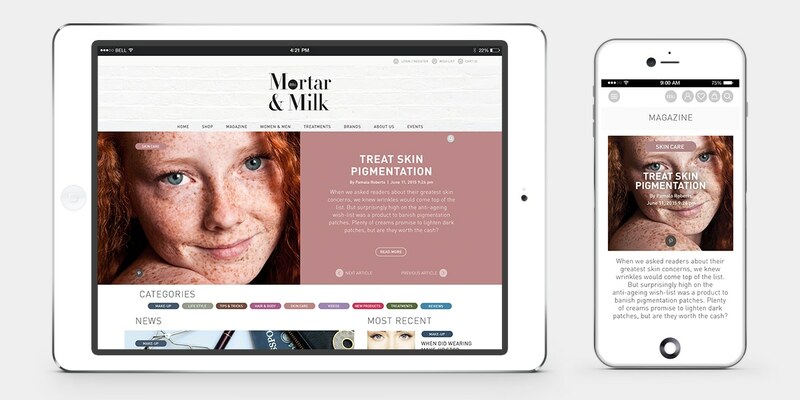 We were briefed to design, build and launch a fully responsive bespoke, e-commerce website for Mortar and Milk a beauty retail/treatment concept store based in Fulham. After meeting with Pam and Nick, the founders of Mortar and Milk. We fully understand the vision they had for Mortar and Milk. We were then able to produced a full set of wireframes for the desktop, tablet and mobile versions which focus on layout, content placement, solving navigation and functionality problems which takes into account user needs and user journeys for the the complete site. 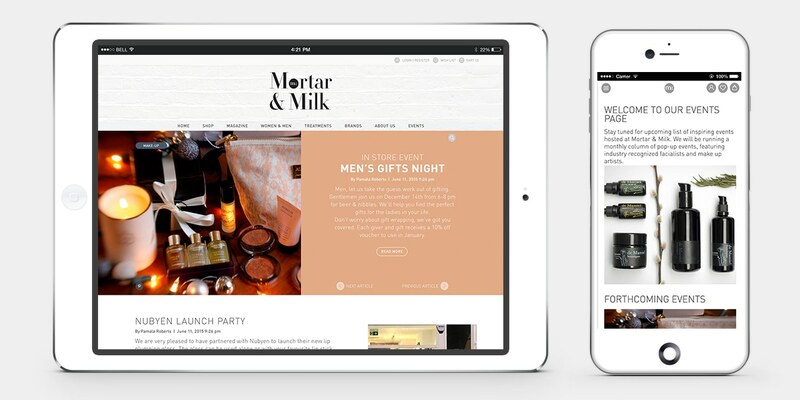 Mortar and Milk wireframe for desktop. 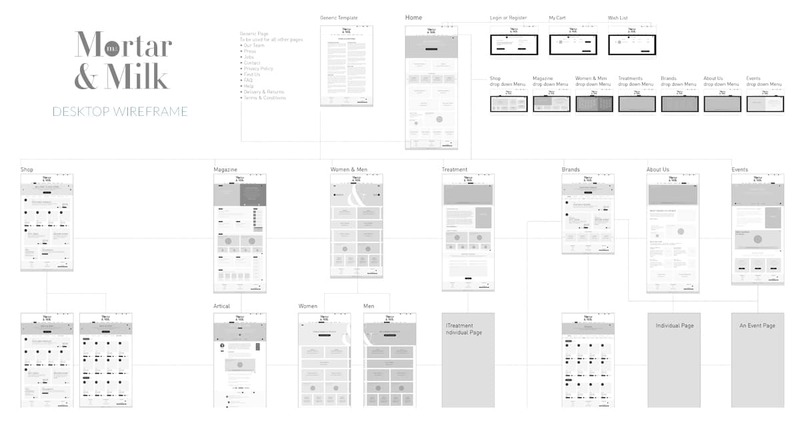 After wireframes have been discussed and agreed on we created and presented a full set creative visuals that would be applied to the wireframe. After creative visuals were approved we developed a full responsive bespoke WordPress E-commerce Theme. After testing we launched Mortar and Milk. 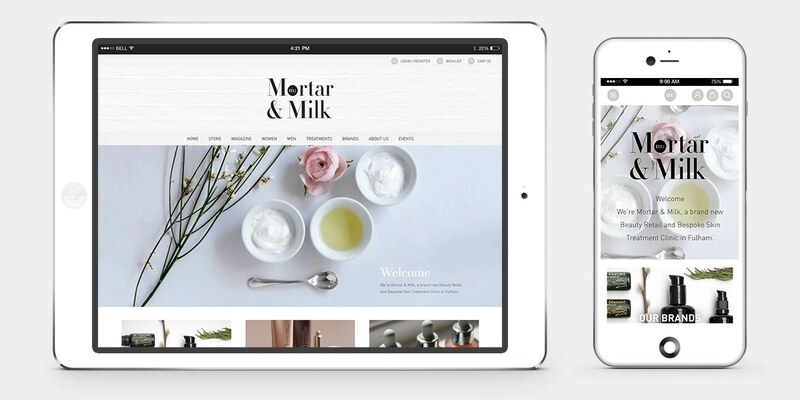 The design reflects Mortar and Milks core brand values. To create a beauty retail/treatment concept store that rivals the competition, gives bespoke service, combines high street brands with cosmeceuticals, provides in depth analysis and treatments and that also caters to men through the creation of a ‘man cave’, filled with male products. The Mortar and Milk environment will be created based on making one feel ‘at home’ as though you are walking into cozy place, rather than just a retail store. The ‘at home’ experience will be felt 360 with our consultants, sales staff, store design, and over all ambiance. When you walk in, you know you are in trusting hands. We strive to create an environment where people want to come to time and again, but will also learn about skin through inner and outer skin nutrition. 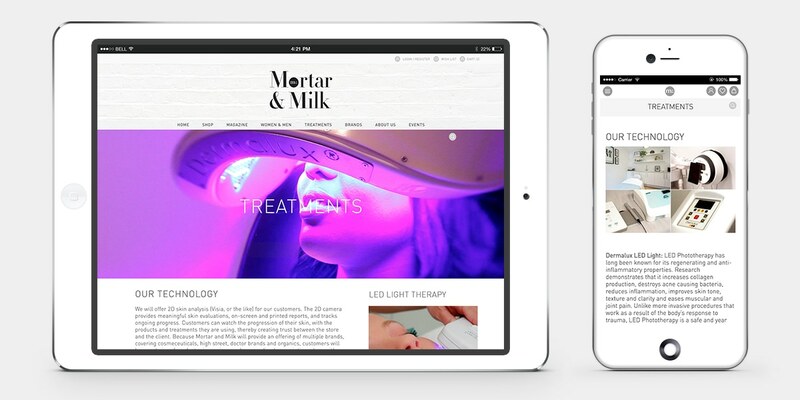 Create a drop-in/appointment LED light therapy service for skin rejuvenation and acne treatment. Create a bespoke service for men’s treatments, including a section of the store dedicated to men’s products. Create an area (replacing the blog ) with a Magazine feel that offers the user all the latest industry news, stories, links, new products, tips and much more. Create regular pop-up events with visiting makeup artists, estheticians, nutritional consultants, and barbers. A Unique Icon set was developed for Mortar and Milk and A small colour palette was created. 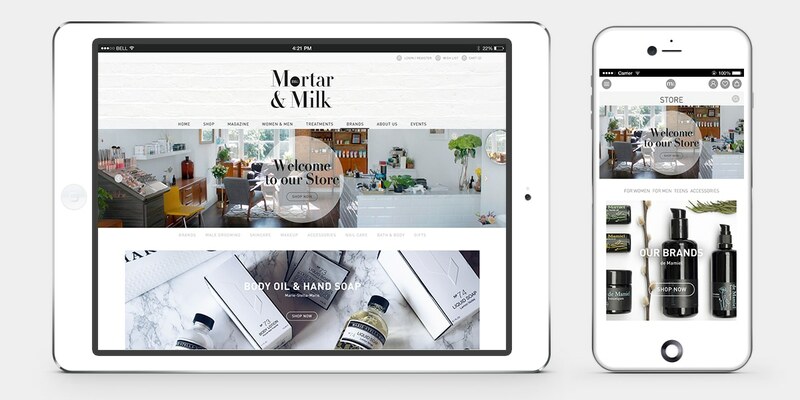 The Mortar and Milk E-commerce Website, a bespoke built theme. Using WordPress and WooCommerce platforms giving the client full control over their content and products.